Since the Pyrenees the Tour has enjoyed Rest Day 1, ridden to the English Channel arriving in St Malo (France's answer to Bournemouth), time trialled to Mont St Michel in the wind and rain and then headed south again with a number of long rolling (supposedly flat) stages to Lyon. Plenty of miles have been covered this week at some quick paces but everything has felt like a build up to today's stage 15 - the monster 242km, being this year's Tour's longest stage, a ride from Givors, south of Lyon, and finishing on the 1900m summit of Mont Ventoux, aka the Giant of Provence. This stage unnerved everyone in the peleton, evidenced last night by the unusual number of bikes awaiting mechanical attention as everyone fretted over their steeds being just right. To tackle Ventoux alone on any given day is a challenge but to wear the legs down with 135 miles beforehand, including four Cat 3 and 4 climbs, and temperatures reaching 35c did not seem doable. This year's Tour organisers have set the route to come up the Bedoin side of the climb meaning you have to circle round the mountain for 13 miles before starting the ascent. This only adds to the mind games as you see her summit's iconic observatory looming up ahead. I was determined to ride today with passion, prudence but above all guts. I was buoyed by the fact that Christian, my CEO, and his old friend Jean-Francois, were riding the stage today. Christian has been particularly supportive of my Tour bid and I was delighted that he got a taste of what it was all about. Both men should be whole heartedly congratulated for their exploits today - chapeau. By this point on tour we are all feeling desensitised to the long distances on each stage. 100 miles just feels like a warm up and we seem to be hitting this distance at around the five hour point most days now. I rode at the front today which was an organised and efficient group. 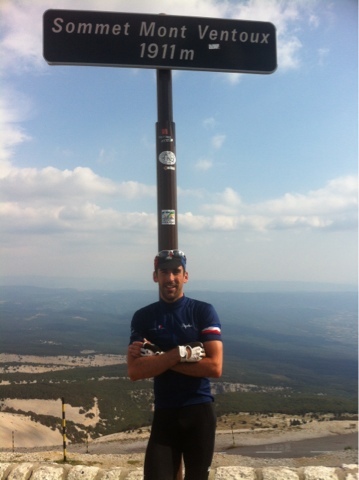 Arriving at the base of Ventoux, the legs felt in good order. Getting onto the 15 mile climb it quickly became apparent why the pros fear it. The lower slopes were an oven and the gradient rarely fell below 10%. I continued to douse myself in water to cool down. As you got higher the air cooled but the all too familiar pain cave beckoned. Once entry had been granted, I pulled up a chair next to the hearth as the torture continued with each pedal stroke. At the top I was completely empty and emotionally drained, but ecstatic to have finished. It had been a strong ride and I was pleased to be the fourth man of the day to roll over the finish line. Probably the single most epic day for me riding my bike. What's more, I now feel like a proper cyclist having summited this legendary HC beast. Despite the sufferfest, I made sure I removed my hat as I went past Tommy Simpson's memorial in the moonscape part of the climb. Simpson, a maverick British mountain rider, died on Ventoux during the 1967 Tour, his last infamous words supposedly being "put me back on my bike". With this gruesome stage behind us, we only have the Alps left to conquer before Paris beckons. There is still much to do but reaching Rest Day 2 tomorrow is another significant milestone. Most importantly we are into the final week. In general, the group looks tired and the rest is much needed. I am dealing with a typical bit of Tour sickness but will hopefully shake it off tomorrow. Nothing unusual there after thrashing my body for 15 days now. 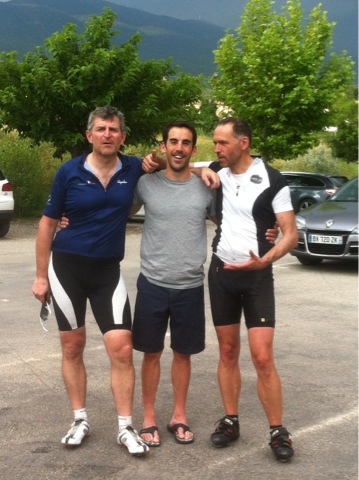 As usual to finish, the snaps: Christian and I looking fresh at the start of today, not so fresh with J-F after the ride and me at the top of Ventoux.